OK, I see on the Internets a photo running around. It’s Halloween, I get it. But I contest this photo. It is really really offensive. Hide your children or impressionable Bible College kids. See how terrible it is?? 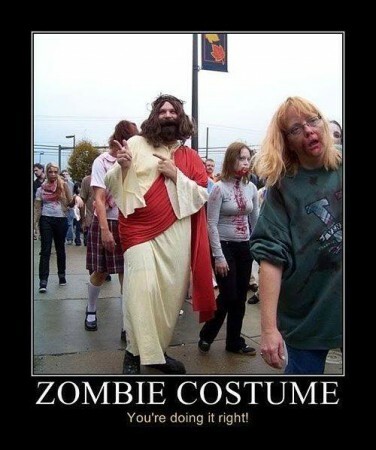 No, not how sacrilegious it is to our Lord and Savior, comparing him to a Zombie. The terrible part is that they got the sacrilegiousness wrong. Any real Dungeons and Dragons player would correct you. Here’s an image that shows how wrong that photo above (click on it to make it more readable). There. If you are going to be sacrilegious, and you pride yourself on being a nerd, at least do it accurately. Never could get a party to survive The Tomb of Horrors. Hey, I was just wondering if you could clarify this picture a little. It says under the vampire heading that he transubstantiated the wine, but according to UMC.org, it says that the idea of the body and blood of Christ in the Eucharist is spiritual rather than literal. Can I get some clarification please? other than that, I enjoy the picture! Hey Will, thanks for the question. The picture is not mine: I just reposted it. If I did a UMC version, it wouldn’t reference transubstantiation because that’s not my tradition. You are correct that UMC see the Eucharist as spiritual (real presence) rather than literal. Ahhhh, okay. Thank you very much! As a United Methodist, I do want to thank you for this blog, it’s really cool! Thanks for this post! I am going to reference this with my youth this Sunday as we start our “Walking Dead” series. When you couple a zombie tv show reference to lessons about us being dead to sin, Jesus being resurrected and that crazy verse in Matt. 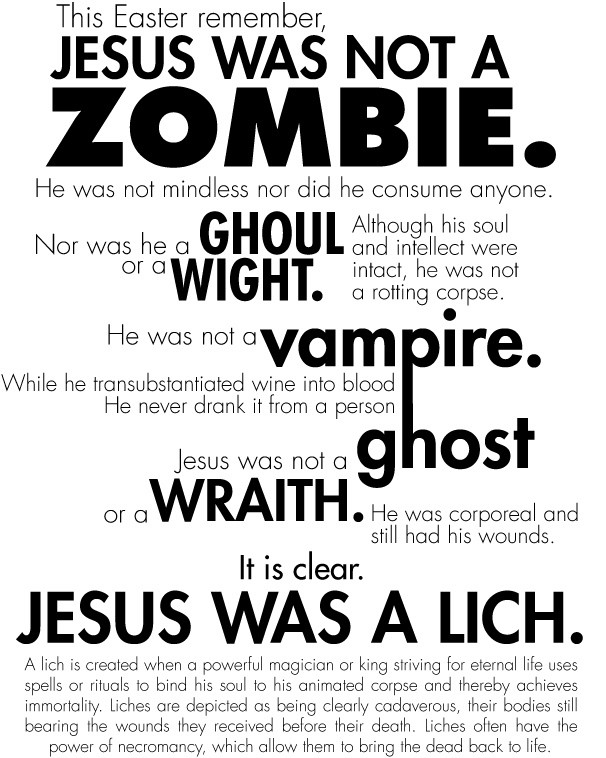 (27:52) I have to draw a clear line about the fact that Jesus WAS AND IS NOT a zombie. I will brace for a resounding and simultaneous “Nerd Alert”…but guilty as charged! Just throwing you a preemptive H/T. PS- Thanks for the clarifying the UMC stance on the blood/wine part. They were gonna ask about that. Glad it was helpful, Ben! Thanks for the h/t! I was surprised by the ending. Too funny! Glad I clicked through to read this. I was worried that you were going soft in your old age. Or turning into a reactionist.